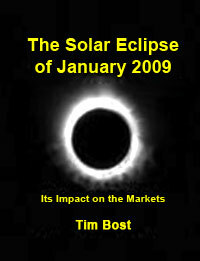 Tim Bost's special research report on the market-moving solar eclipse of January 2009 includes vital money-making information on how eclipses impact financial and political realities, and how this particular eclipse cycle offers unique opportunities. This comprehensive 74-page study features more than four dozen detailed charts and illustrations that clarify the eclipse dynamics, plus more than 100 specific times to watch for significant geopolitical events and profitable opportunities in the markets. It's an entertaining read as well as an insightful tool that can help you identify fresh opportunities as you explore present conditions in the light of critical lessons from the past. The effects of the Solar Eclipse of July 2009 on geopolitical events and on the financial markets are thoroughly illustrated and discussed in this fascinating e-book.